SuperMatch is a fundraiser based on professional football’s championship game. The fundraiser is super affordable, super simple to run (there is no inventory to manage or orders to fulfill), and super fun! Best of all, in this fundraiser you earn 70% profit for every $5 CharityMania ticket you sell. The big game is February 3, 2019 so make sure to signup before January 23rd. Our super squares pool-like game is based on pro football’s championship game. A fantastic add-on or standalone fundraiser. FootballMania is an exciting sweepstakes fundraiser that is based on the popular “Squares Pools” played during pro football’s championship game. Sweepstakes participants can win up to $5,000 in prize money by simply matching the numbers on the back of their game card with the score of pro football’s championship game at the end of each quarter of play. The more quarters that match, the more the participant can win! Every game card is unique and has a minimum 1 in 14 chance to win a prize. Determining your profit with FootballMania is easy. To raise money, you sell CharityMania Tickets for $5 and keep 70% of the money you collect. Ticket holders receive $5 worth of premium digital music downloads (read why the music is important for this fundraiser), and they are entered into the FootballMania sweepstakes. Sell 10 tickets or 10,000 tickets… you make $3.50 on every ticket. It is really that simple. You determine how many CharityMania tickets you need and then purchase them from us for 19¢ per ticket (to cover the printing costs) plus shipping and a $10 handling fee per order. You then sell each CharityMania ticket for $5. With each sale you pay $1.50 to CharityMania to cover the costs of the music downloads, the management of the sweepstakes, and any prize money your game cards may win. The remaining $3.50 is your profit! Sell 10 tickets or 10,000 tickets… you pay $1.50 for only those tickets you sell. View our Financial Flowchart for more details about payments and when they are made. 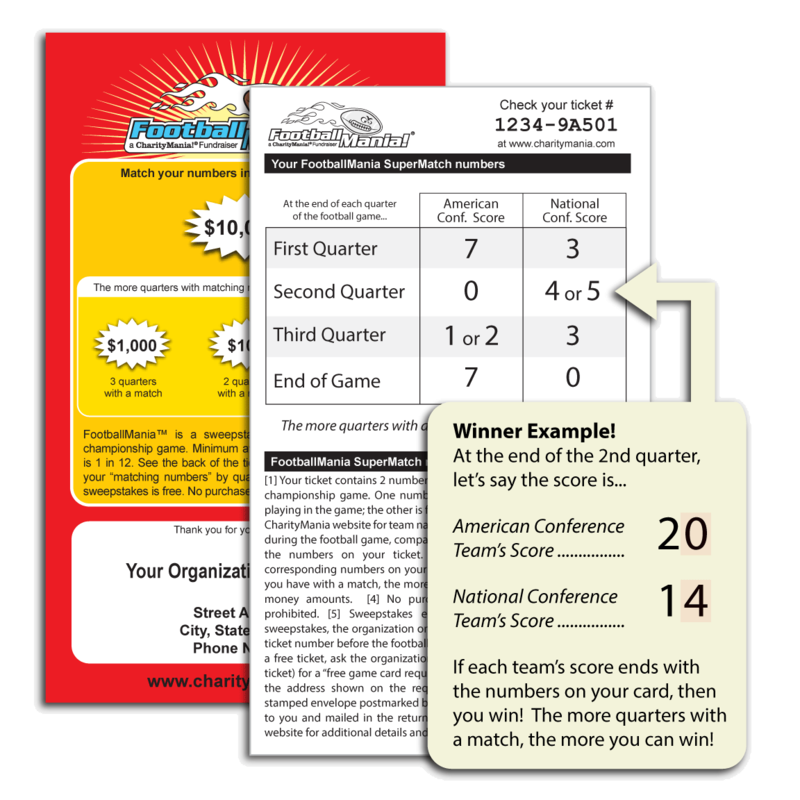 Sweepstakes participants can win up to $5,000 in prize money by simply matching the numbers on the back of their game cards with the scores of pro football’s championship game at the end of each quarter of play. The more quarters that match, the more the participant can win! We then send you the prize money so that you can send it to the winners with a personalized letter thanking them for their support. Ready to Get Started with a FootballMania Fundraiser? Signup now! Signup for a FootballMania fundraiser. Make sure you order your tickets early enough to distribute and sell them before the sweepstakes begins.